Our wiglets and hair toppers for thinning hair are designed to fill in sparse spots and add volume to make your problem areas disappear. We call them “wiglets” because they’re like mini wigs, offering coverage only where you need it. They’re easy to attach and blend seamlessly in with the locks you’ve already got. For guidance, call an expert at 1-800-264-4287 (HATS) - we’ll help you figure out what type of hair topper will meet your needs. 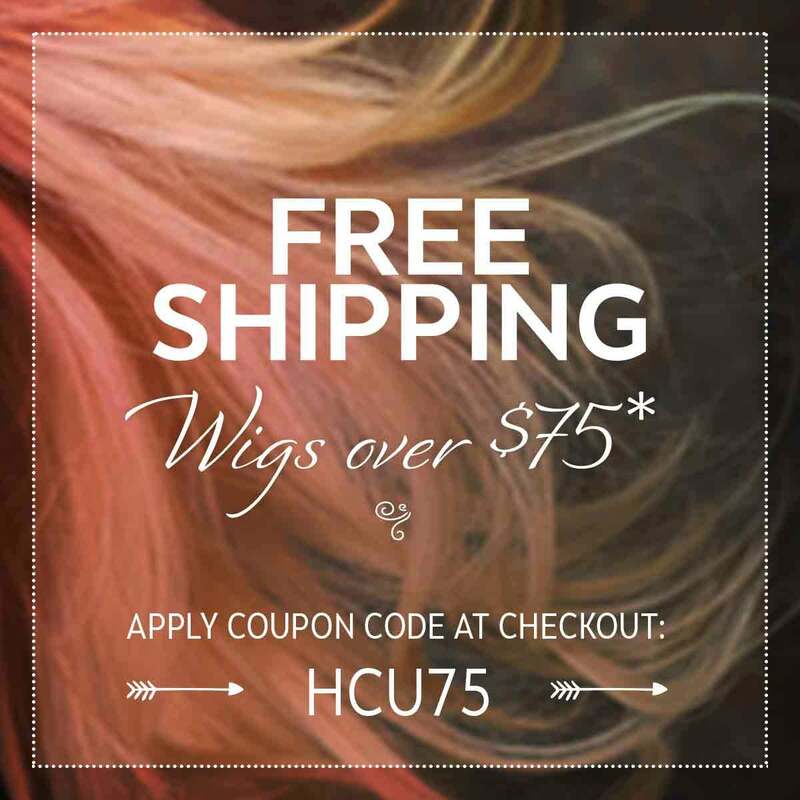 Headcovers offers a large selection of wiglets and hair toppers for thinning hair. Designed to conceal various degrees of hair loss on targeted areas of the scalp, we often refer to wiglets as half wigs since they clip right in to your existing hair. Our hair toppers come in a large selection of colors, sizes, and textures. Whether you’ve got long or short hair, straight or wavy, we’ve got what you need to make that thin spot go away - or at least, cover it up! At Headcovers we understand that hair loss affects everyone differently, so our products offer a range of coverage types. Some are meant to cover thinning parts and others are best for a thinning crown or top of the head. When attached correctly, the hair piece will be invisible among your natural locks. Not everyone who goes through chemo will lose all their hair - some cancer patients experience partial or patchy hair loss. This can also occur as a result of aging, alopecia, autoimmune diseases, stress, trichotillomania, and other conditions. That’s where hair toppers come in handy. Wiglets and hair toppers are the perfect option for cancer patients and anyone else with thinning hair in specific areas of the scalp. The beauty of these mini wigs is that you can combine several to cover more than one area, making them a terrific alternative to a full wig. Consider wiglets your “in between” solution for thinning hair. Maybe a full wig feels too heavy, or a hat just doesn’t suit your style. Hair toppers are appropriate for work and stylish enough to help you feel normal, no matter the circumstances. Just clip one in and watch the bad hair day blues melt away. What Type of Hair Topper Should I Get? Perhaps the most intimidating part of shopping for hair toppers is figuring out what type to buy. Here’s what you need to know: we offer products in three main sizes - small, medium, and large - targeting three specific areas of the head - part/hairline, top of the head, and at the crown. The best way to get started is by measuring the thinning spot on your head to understand what size topper you’ll need. Take a soft measuring tape and measure at the widest points of the problem area. Then head over to our Hair Topper Style Chart to see our curated selection of products based on the size and location of your loss. If you’ve still got questions, check out our Hair Toppers & Wiglets resource, a comprehensive guide to help you purchase the right clip on hair topper. How Do I Attach My Hair Topper? What Material Should My Wiglet be Made of? The material of your top hair piece determines how you’ll be able to style it, as well as the price, care instructions, and lifespan of the product. At Headcovers, we offer four main types of wiglets: human hair, Remy human hair, synthetic hair, and heat friendly synthetic hair. While synthetic is lower maintenance, real hair offers coverage that is virtually indistinguishable to the wearer as well as the observer. In other words, it feels just as authentic as it looks. Human hair toppers (both normal and Remy) and heat friendly synthetic hair are beloved by many for the flexibility when it comes to styling. These hair pieces can withstand heat tools so you can curl or straighten to your heart’s content. But if that’s not a priority for you - if, in fact, you’d rather your wiglet maintain its predetermined shape forever - then opt for a regular synthetic style. Synthetics are low maintenance, easy to care for, and typically last longer than human hair toppers. And thanks to technology today, they have a super realistic appearance, too. If you’re still on the fence, browse through our Synthetic Hair vs. Human Hair guide to figure out which material will best fit your lifestyle, budget, and needs. And remember that whichever clip on hair topper you choose, all of our products have been vetted by the Headcovers team for top-notch quality. So really, it’s hard to go wrong. Which Cap Type Should I Choose for My Hair Topper? Wig caps are perhaps one of the most confusing wig elements to newcomers. After all, if you can’t see it, why does it matter? Well, the cap type determines how delicate a wiglet is. You’ll notice that we offer four main cap types: classic, monofilament, lace front, and hand tied/full lace. Here’s the rundown. Classic caps are usually the most affordable, and feature rows, or wefts, of hair. To help the wiglet intermingle with your own ‘do, pull strands of your natural hair through the wefts around the edges. This cap type is great for first time wiglet wearers. The base of a monofilament wig is formed by attaching each individual hair to a flexible mesh material. This gives a highly realistic appearance when it comes to the way the strands move - softly, just like real strands of hair. The next two types, lace front and hand tied/full lace, are typically the most expensive - but rightly so. These wiglets start with a piece of lace. Individual strands of hair are then intricately hand-tied to the fabric. Even the direction of the strands is artfully controlled, so that your lace wig really looks like actual hair, even at the roots. Should I Buy a Wiglet or a Full Wig? The key to figuring out which product category to shop is understanding how advanced your hair loss is. At Headcovers, we’ve determined three main buckets: beginning, progressive, and advanced stage hair loss. Beginning stage is the initial thinning of certain areas, when loss is dispersing gradually. It’s not so bad that you need to cover your head completely, but it’s just enough to irritate your insecurities. In this scenario, a small base size would probably be fine. When your hair loss becomes noticeable in patches, you’ve likely entered progressive stage hair loss. If you can see your scalp shining through from a couple of feet away, a medium to large base would likely offer adequate coverage. Finally, if your hair loss is very noticeable and the bald spot is completely bare, that’s what we classify as advanced stage; in this case, a large topper would be your pick for total coverage. But if you’ve got more than one of these problem areas on different parts of your head, it may be time to consider shopping for a full wig. If you’re having trouble stomaching that idea, we understand. Perhaps begin by browsing our hats, turbans, or head scarves to find a coverage method that suits your fancy.